Plants can actually clean the air in your home, improving indoor air-quality, increasing oxygen levels, and absorbing airborne toxins released by treated carpets and upholstery. Research done back in the 1980’s by NASA scientists and a national association of professional landscaping contractors determined conclusively that indoor plants improve air-quality. Researchers found that in addition to producing oxygen and absorbing carbon monoxide, many plants that actually filter out common Volatile Organic Compounds (VOC’s) emitted from chemicals in carpeting and upholstery. If you’re looking for a breath of fresh air indoors, here are some plants that can help you breath a little easier. Aloe Vera can help clear the air of formaldehyde and benzine. These chemicals are emitted as by-products from some chemical cleaners and paints. Aloe thrives in sunny spots, so placing this variegated beauty on a side table or desk near a window is a great choice. Gerbera Daisy can help clear the air of that trichloroethylene that’s emitted from the dry-cleaned suits and blouses hanging in your closet. This is a great plant for the bedroom, near the closet, but it also needs to be near a window, and requires a small drink daily. Gerbera Daisy offers some color, but loves sun and water, so make sure you’re ready for the commitment when you pick up this little lady. If you’re looking for a floor plant to fill a corner space by the window, the Weeping Fig (or Ficus) is a great choice. Don’t overwater, and you can rely on this beauty to filter toxins commonly found in varnish, carpeting and furniture. 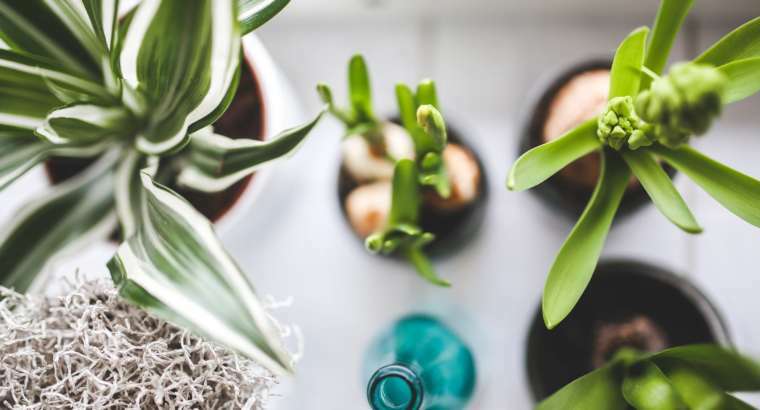 For a cleaner, fresher home an investment in some little plants can add a touch of color and some fresh clean air, helping you feel a little better about staying home.